I’m not talking here about Nordic or back-country skiing, but downhill skiing between two countries. In other words take a lift in the morning in one country, and have lunch in another. There are a number of resorts where you can ski from one country to another (and back), but not surprisingly they are all in Europe. Perhaps the most famous is the Matterhorn Ski Paradise which links Switzerland and Italy. Zermatt lies at the foot of the ski area on the Swiss side and Breuil Cervinia lies across the Italian border, with the majestic Matterhorn standing over both of them. Cervinia is cheap and cheerful, Zermatt not only provides the best views of the Matterhorn it is possibly the most complete ski resort in the world (and one of the more expensive). The Silvretta Ski Arena bridges Switzerland & Austria, and there are even border control posts on the piste – although I have never seen them manned. 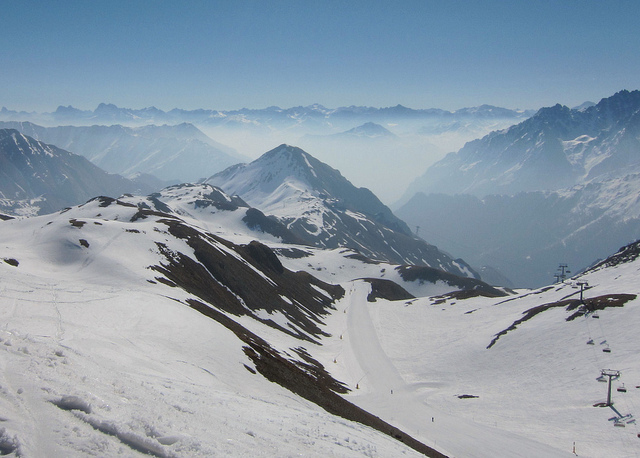 Duty-free Samnaun lies on the Swiss side whilst the party town of Ischgl is in Austria. Les Portes du Soleil is a huge sprawling resort between France & Switzerland, with o650km of piste. There are a whole bunch of ski resorts in the circuit, with Avoriaz and Morzine in France and Champéry in Switzerland amongst the more notable. The Milky Way between France & Italy is not quite as big, but with 410km of piste is still one of the largest ski areas in the world. Montgenèvre lies in France, whilst across the border in Italy are Clavière, Cesana, Torinese, Sestrière, Pragelato, San Sicario and Sauze d’Oulx. Espace San Bernardo links La Rosière in France with La Thuile in Italy. 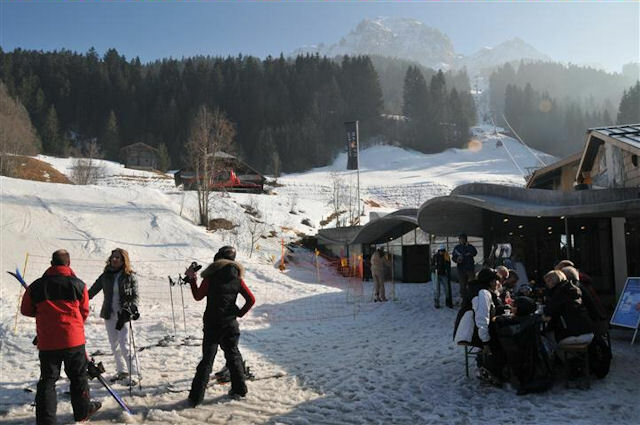 Kanin-Bovec-Sella Nevea is one of the newer cross border resorts, linking Italy and Slovenia. Nassfeld-Lake Pressegger is a little known resort in Carinthia, but it has 100km of piste and has runs that cross the Austrian border into Italy, and it is possible to have lunch on the Italian side of the border. Not strictly speaking a cross-border resort but a section of Gstaad Mountain Rides links the Swiss German part of Switzerland with the French-speaking part, crossing the Röstigraben. So it is possible to take up a lift from Rougemont to the La Videmanette ski area from where you ski or snowboard down to Chalberhöni and Gstaad. Equipment available right here on Tom Wohrman Sports.